Today’s market is a digital one, and that means SEO is an essential part of building and running any successful business or website. Making sure that you are attracting your target market with the right keywords is key to gaining new customers as well as maintaining a client base. It also means that you can ensure you remain at the top of internet search results, but you can’t do this alone. That’s where a SEO and Rank Tracking tool like AccuRanker comes in. In this guide, I will take you through a full review of this excellent, high-performance rank tracking software. AccuRanker is a form of cloud-based technology that tracks local and global rankings on a daily basis on Google and Bing. You can track these amazingly accurate results in a wide range of areas, including by keyword, postal code, city, or state. 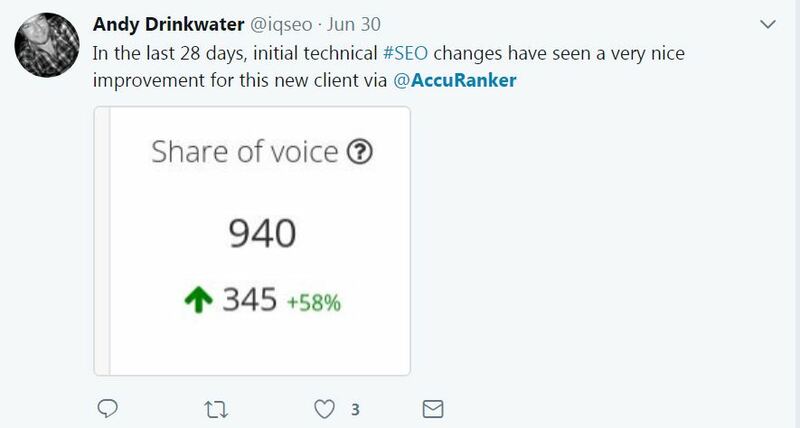 Plus, it records these results so that you can access them via the historic data option, allowing you to keep track of changes and trends – you can also import your historical keyword data directly from other SEO tools or from a CSV-file so you don’t loose your information if you transfer from another rank tracker. It allows you to make strategic decisions by using additional analytics data per keyword, which includes the search volume for it, the traffic potential for that keyword and the preferred URL function. You can see your position in the marketplace compared to your competitors, as well as track their activity and fluctuations in ranking positions. Essentially, it is the ultimate SEO keyword ranking tool for helping you to keep track of marketplace changes, your own keywords, and how your competition is doing. 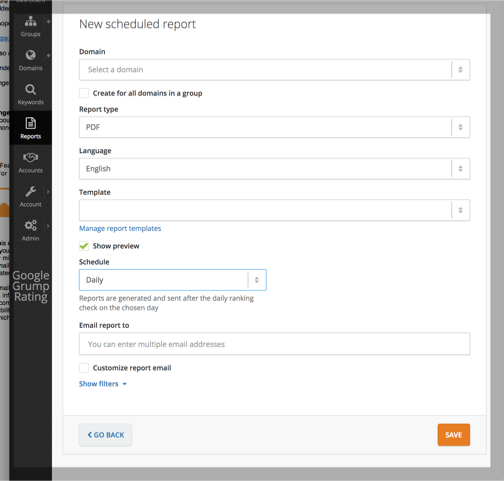 It features automated, custom reporting, so you can streamline reporting for clients with a simple drag and drop system. You can white label your reports – hand pick your data, add logos, branding and text with the customisable email feature. They also offer “Set it and Forget it” reporting – on both the automated Standard and Custom Reporting – report to clients daily, weekly or monthly. The API is simple but also powerful, and it allows you to access any parse data you need quickly. AccuRanker is the fastest rank tracker in the world – results update daily, or can be requested and updated on demand, so you know you are getting the latest results and can stay ahead of the curve when it comes to your competitors. You can structure your data using star-marking, categories and tags and notes functions to make large amounts of keywords easier to analyse and interpret. It provides ranking results for desktop, mobile, and any location of your choosing. Importantly, the UI is easy to use, which allows you to navigate the software easily so that you can get things done. It allows for team management, so you can track who is doing what at all times. You can also set roles and permissions accordingly so that your team knows which account they are working on. 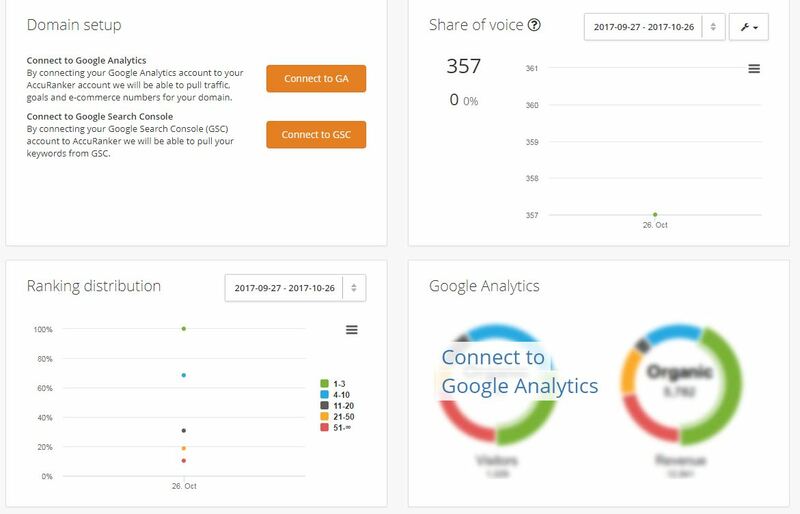 The Share of Voice feature enables you to see at a glance your share of the marketplace vs your competitors on your keywords placed between 1 – 20. The Share of Voice is calculated by using only those keywords currently ranking in the top 20. The pricing for AccuRanker services is actually incredibly reasonable, especially considering how expensive it can be to hire SEO professionals. However, it is important to remember that when you have an expert, you are going to be getting the best possible keywords, SEO results, and rankings. 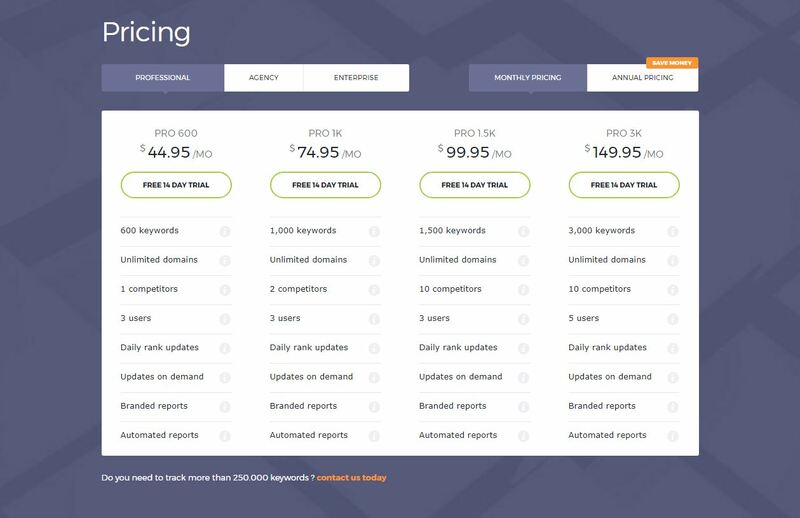 Prices for AccuRanker start at $44.95 a month, and for that price, you get a load of features, including 600 keywords and unlimited domains. Each of the services on offer also come with a two-week free trial, so you can get a feel for the services being offered and see if it’s the right choice for you. Plus, you can cancel the trial at any time without needing to commit to a contract. AccuRanker also has 2 additional SEO tools that are free for anyone to use. The first of these is the incredibly popular Google Grump. 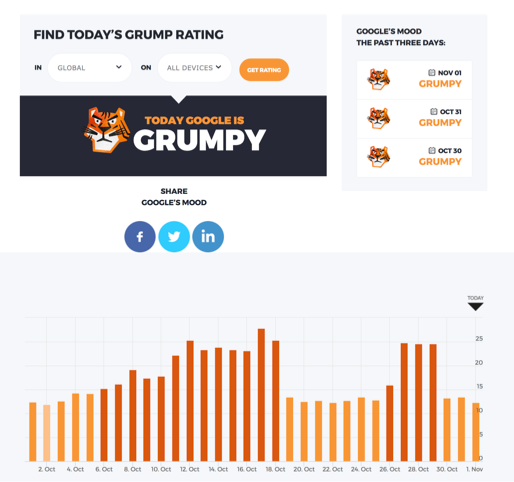 Used on a daily basis by leading industry experts, AccuRanker’s ‘Grump’ Rating highlights unrest in Google’s algorithm. The grumpier the mood, the bigger the fluctuations in rankings. You can track Google’s algorithm activity on Desktop or Mobile, and view Global results or view by country selection. You can sign up for customisable alerts and make sure you never miss a Google update. 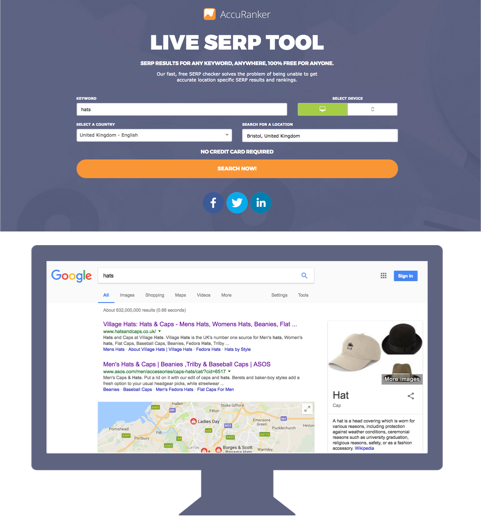 The second – released recently is the Live SERP tool – you can get fast, free and accurate location specific SERP results from anywhere in the world, again on Desktop or Mobile. And it’s 100% free for up to 5 searches per day. Now that you know more about AccuRanker, it’s simple and fast to get your free trial set up. Keeping track of your SEO can be tough, especially when you have so much to do, and this software allows you to keep an eye on what your team are doing, as well as see if they are producing results that benefit your business. I genuinely believe that this rank tracking tool has the potential to provide tremendous value to your business. Give it a try for 14 days – totally free and see what you think. In the age of digital marketing, SEO can make or break a business, so make sure you are on top of everything. Many thanks to upcoming superstar marketing ninja @angelabudd for all info in regards to Accuranker.